Air is your enemy. Any air that touches your fish will destroy it. It’s that simple. So you must prevent air from contacting the fish by vacuum-sealing it, glazing it or wrapping it tightly — this is in order of preference. If you catch a lot of fish or buy lots of fresh fish from the market, buy a vacuum sealer. They’re worth every penny. If you choose not to do so, you can glaze the fish by dipping them in cold water and putting them on a sheet pan in the freezer. Let that water freeze, then repeat the process several more times to get a 1/4 inch thick ice glaze on the fish. You can then put your glazed fish into a plastic bag for storage. You can wrap your fish in plastic wrap, then put them into a plastic bag, but I don’t really recommend this for more than a few days. It just is not as effective at preventing moisture loss and freezer burn as the other methods. Remember that the weather in a freezer is just fine for many fish. What do I mean? Think about cold-water fish such as cod or haddock: They spend their lives in water that is only a few degrees above freezing, so putting them in the freezer will not be as radical a change for the meat as it would be for, say, a steak or a chicken. This means you will get less of a loss in flavor with many frozen fish than you would with frozen terrestrial meats. 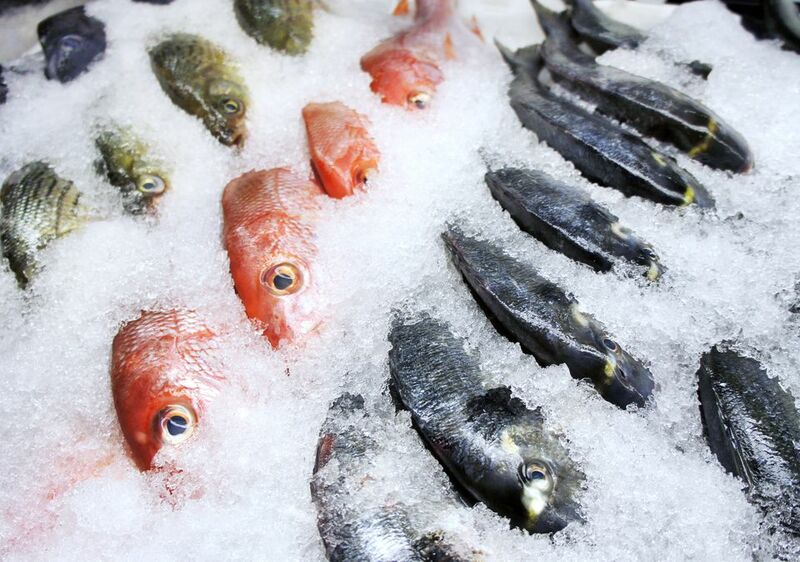 How long can you freeze your fish? Never longer than 6 months. After that, you will notice a serious decline in quality. Fatty fish, such as salmon or trout, go down hill even faster: Don’t freeze them longer than 3 months. And some fish should never be frozen. These are the fattiest ones, the bluefish, herring, mackerel, and sardines. You can glaze them, but they still decline in quality a lot. If you find yourself with a surfeit of bluefish — this happens a lot — vacuum-seal them and know that you will be making fish cakes with them down the road; that’s all they’ll be good for. When you thaw your frozen fish, do it gradually. Never put them in the microwave to thaw!! Let them thaw in the fridge or in cold water. Thawing at room temperature is also a bad idea.